This is an account of the experiences of members of the Scandinavian Alliance Mission of North America in China, during the Xinhai Revolution of 1911. My thanks to Redcliffe College for providing a copy of this public domain title for digitisation. 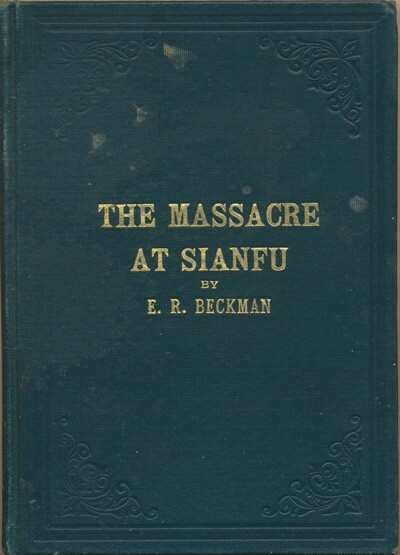 The terrible incident which took place at Sianfu, China, when the revolution broke out there in October 1911, has greatly stirred up the feelings of a large number of friends of the Mission in the homelands. I have repeatedly been asked to relate the story of this outrage by which some of my fellow workers and I were cruelly beheaded our dear ones, whose blood was shed, so to speak, to saturate the gospel seed which had been sown du1·ing the preceeding years; and how I succeeded to rescue my youngest child, a four year old girl, by running through the raging mob, which pursued and hunted me throughout the night. In order to satisfy the many friends who wished to know the details of this incident and still avoid the hard task of continually repeating this heartrenching story, a book was published in the Swedish language soon after I arrived in Sweden on my way from China relating this sorrowful event.